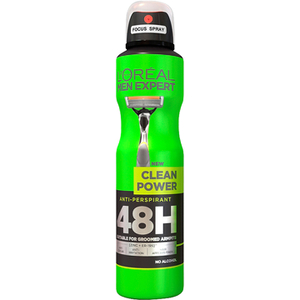 Stay fresh and dry with the L’Oréal Paris Men Expert Clean Power 48H Anti-Perspirant. Suitable for groomed underarms, the long-lasting deodorant is designed to make hair appear thinner upon regrowth, and its 48 hour protective formula harnesses the odour combatting powers of antibacterial Zinc + ER-195 to leave underarms feeling fresh, clean and protected. Infused with a fresh, woody fragrance and anti-wetness micro-captors, the anti-perspirant will leave you feeling dry and comfortable with a clean, refreshing scent. - K.N.